Easter comes early for Nebraska fisheries workers; we have crews out collecting eggs already! No, they are not wandering around looking for some pretty chocolate-covered candy eggs that some Easter bunny dropped someplace; they are out collecting fish eggs to produce fish to stock in Nebraska waters! We have had crews working on the Valentine National Refuge this week collecting northern pike eggs. I got a quick update today and it sounds like that has been going well and those guys may be close to having all the eggs we will need this year. They usually catch some yellow perch along with the northern pike and they will hold some of those fish so we can collect eggs from the perch too. Perch spawn a little later than the pike, so the perch we catch with the pike are not yet “ripe” or ready to spawn, but they soon will be. We can hold those perch in the hatchery for a short period of time and when they are ready we can then get their eggs too without having to go back out in the field to catch more fish. The pike and perch are caught in frame nets that are set in shallow water on the shoreline or near the shoreline. Frame nets essentially trap the fish in an enclosure in which they swim around in until the crews “run” the nets. Fish caught in frame nets are released alive after we are done with them. Next week we plan to send crews out to collect sauger eggs. That work will be done on the Tri-County canal system. We have discovered that sauger in that system spawn in relatively deep water, a lot deeper than walleyes spawn, and gill nets are used to capture our sauger spawners. Gill nets entangle or “snare” fish and there can be some mortalities. But, when we are collecting spawners we obviously need live, healthy fish so those gill nets are run after they have been in the water for a relatively short period of time. With the short soak times and cold water temperatures almost all of the fish caught in gill nets will also be released with no harm after we have collected eggs from them. We intend to kick off our biggest egg collecting effort the first full week in April. We will be collecting walleye eggs at Sherman, Merritt and McConaughy reservoirs this spring. We collect most of the female brood walleyes with large-mesh gill nets that are set at night and are run on an hourly basis. Male walleyes are easily collected by running an electrofishing boat down the dam face; a hundred yards or so will usually produce all the willing males we need for the entire egg collection effort. I realize that the walleye egg collections can inconvenience some anglers. We try to do as much of that work during the week as possible and back off on the weekends. We have a dam closure at Sherman, so we usually have no conflicts there, and we collect walleye spawners all over Merritt and usually have no conflicts there. At McConaughy there will be a closure on the north end of the dam so we can get in and collect a maximum number of walleye brood fish in the shortest possible time and then get out of there. If you are on the water on any of the waters where our crews might be working, please avoid the nets; they will be marked and you should be able to see them and avoid them. There is a story in the most recent Outdoor Nebraska newspaper that explains a little more about the production of fish in our state hatcheries, check it out, http://www.ngpc.state.ne.us/admin/onnewspaper.asp . I found a video on-line that explains the walleye egg collecting process. It is not a Nebraska video, it was produced by our good neighbors to the north. The procedures are very similar no matter where the spawning walleyes are collected, but I will point out one difference. You will see the South Dakota workers capturing their walleyes in frame nets. We have used frame nets for collecting walleye spawners, but not much anymore. By using large-mesh gill nets we can select for the larger females that we need, and as I mention we then collect all the males we need with electrofishing boats. Frame nets will work for capturing spawning walleyes but once the frame nets are set, they have to be run every morning regardless of weather conditions. I have run up and down the rocky dam faces of more than one Nebraska reservoir to get walleyes out of frame nets, from the shore, because the waves were too big for us to safely run the nets from a boat. Believe me, that ain’t no stinkin’ fun! And, when the waves crash into our frame nets like that you have a bunch of adult walleyes sitting in there getting beat up on the rocks. The large-mesh gill nets are a better way of catching female walleyes because we can select for the larger females by using the larger-mesh nets. We only set those nets when it starts to get dark and then we run those nets after only an hour or so. If the weather is crappy on a night when we want to capture female walleyes, we simply do not set the nets; then we do not have to risk life and limb to run those nets and get the fish out of them. Anyway, I am rambling, here is that video . . .
Let me say one more thing about the early spring egg collections. I do not get out and do as much field work as I used to, but I try to help with the eggs collections when my schedule allows. Here is usually the way it goes . . . on some glorious, warm, sunny, beautiful early spring day folks are out and about and stop by to watch what we are doing. Invariably someone makes the comment that we sure have great jobs, and we do! It is great to see all those big fish and get to work with them. But we have to collect those spawners in early spring regardless of weather conditions. Some days are beautiful but then there are days when I have been helping with egg collections when we worked in snowstorms, hailstorms, lightning, rain, sleet, you name it. I have seen nights, did I mention that some crews will work all night long?, where it was so cold that our boat decks were slicker than snot on a doorknob because water was freezing on the deck. We were throwing hand-fulls of sand on the decks to keep from slipping and breaking our butts or worse. I have seen waves on Harlan or Sherman or Branched Oak that were so bad that I wished we had a Coast Guard cutter instead of the work boat we were in. No matter what you do while working on the spawning crews, you will be wet. Sure we wear waders and rain gear and float coats and gloves and layers of clothes and socks, but when working with fish and in the water, you will get wet, at least a little bit. And that early spring water sure is cold! But when the fish are spawning they are spawning, they ain’t gonna wait and we have to “Get R Done”. Now I know that sounds like whining, but the egg collections are a lot of work. We invest a lot of man-power and effort under all manner of early spring weather conditions to collect those fish. After a few days a guy does wish for a warm bed, a hot meal, and a dry set of clothes. We do it because we love what we are doing, we love those fish, and we love making the “Good Life” even better by collecting those eggs so we can produce fish for Nebraska anglers to catch (myself included)! Where do you access the canal to collect Sauger? What is there preferred spawning depth and temp? The guys work on the canal above Johnson. There are some of the “check” structures on that stretch of canal where the sauger congregate. Spawning temps. would be about the same as walleyes, but I would tell you end of March, first of April they will be spawning. I do not believe it is water temperature as much as the amount of day light or photoperiod that cues their spawn. Of course in the canal with running water, other cues could be important, but they spawn about the same time every year. Walleyes spawn in shallow water, often right next to the shore. 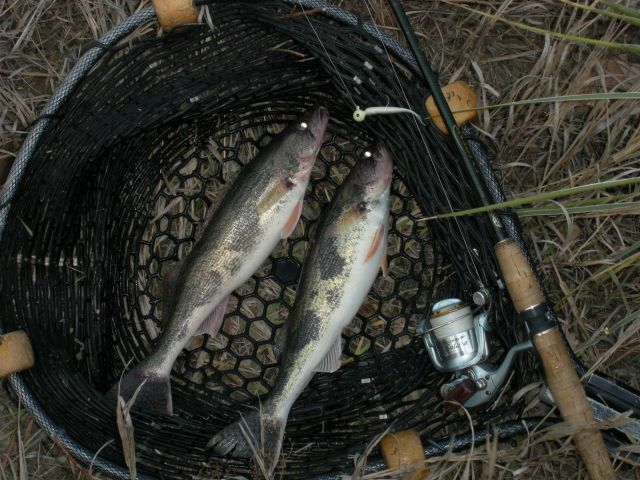 It is not unusual for sauger to spawn in water quite a bit deeper than that, even as deep as 10-20 feet.